Amazon has got this set of 4 CucinaPrime stainless steel mixing bowls for only $12.99 with free Prime/SuperSaver shipping and are an Amazon #1 New Release. Includes a 3-quart, 5-quart, 8-quart and 13-quart bowl. 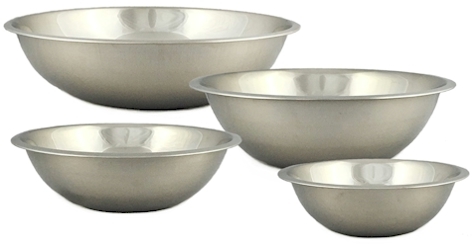 Set of 4 stainless steel bowls. Sizes: 3-, 5-, 8- and 13-quart. Must have for any home or restaurant kitchen. Perfect for mixing batter, whisking, tossing salad and marinating. Bowls nest in each other for easy storage.